William A. 'Bill' Bolick, half of the influential country harmony duo the Blue Sky Boys, passed away on March 14 at his home in Hickory, North Carolina. He was 90 years old. He was the tenor harmony vocalist in the duo, and he and brother, Earl A. Bolick (who died in 1998), were probably one of the greatest of the brother duet teams to emerge in the 1930s. Both brothers were born in Hickory, North Carolina: Bill on October 28, 1917, Earl on December 16, 1919, they were the sons of Garland Bolick, who grew tobacco and worked in a textile mill. The two brothers began playing traditional material in their mid-teens. Bill learned to play the guitar and, having taught it to his younger brother, eventually took up the mandolin. Performing in and around the Hickory area, in 1935, Bill sang with the East Hickory String Band—a name later changed to the Crazy Hickory Nuts, after JW Fincher of the Crazy Water Crystal Company, who offered them a job in Nashville—and the same year the brothers began singing duets on the local radio station as the Blue Ridge Hillbillies, usually accompanied by Homer Sherrill. In 1936 they were due to audition for RCA Victor, but shortly before the audition the Bolicks and Sherrill parted company, so it was decided that Bill and Earl would attend the audition as a duo. A8-R man, Eli Oberstein, was suitably impressed and had them record ten song then and there. Bill was 18 and Earl just 16 years old. Their first release—on Bluebird—was the Sunny Side of Life, though credited to Bill, the brothers had learnt it from an old hymnal. 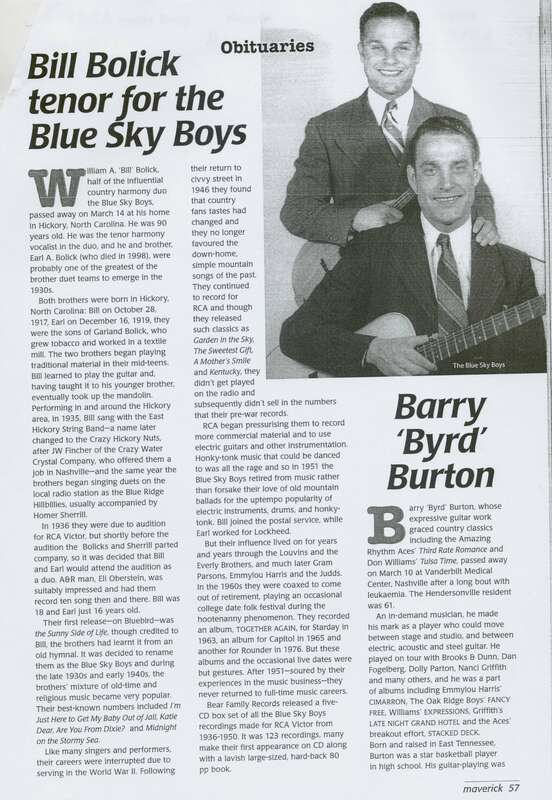 It was decided to rename them as the Blue Sky Boys and during the late 1930s and early 1940s, the brothers' mixture of old-time and religious music became very popular. Their best-known numbers included I'm Just Here to Get My Baby Out of Jail, Katie Dear, Are You From Dixie? and Midnight on the Stormy Sea. Like many singers and performers, their careers were interrupted due to serving in the World War II. Following their return to civvy street in 1946 they found that country fans tastes had changed and they no longer favoured the down-home, simple mountain songs of the past. They continued to record for RCA and though they released such classics as Garden in the Sky, The Sweetest Gift, A Mother's Smile and Kentucky, they didn't get played on the radio and subsequently didn't sell in the numbers that their pre-war records. RCA began pressurising them to record more commercial material and to use electric guitars and other instrumentation. Honky-tonk music that could be danced to was all the rage and so in 1951 the Blue Sky Boys retired from music rather than forsake their love of old mountain ballads for the uptempo popularity of electric instruments, drums, and honky-tonk. Bill joined the postal service, while Earl worked for Lockheed. But their influence lived on for years and years through the Louvins and the Everly Brothers, and much later Gram Parsons, Ernmylou Harris and the Judds. In the 1960s they were coaxed to come out of retirement, playing an occasional college date folk festival during the hootenanny phenomenon. They recorded an album, TOGETHER AGAIN, for Starday in 1963, an album for Capitol in 1965 and another for Rounder in 1976. But these albums and the occasional live dates were but gestures. After 1951—soured by their experiences in the music business—they never returned to full-time music careers. Bear Family Records released a five-CD box set of all the Blue Sky Boys recordings made for RCA Victor from 1936-1950. It was 123 recordings, many make their first appearance on CD along with a lavish large-sized, hard-back 80 pp book.